Newer ranch duplex. 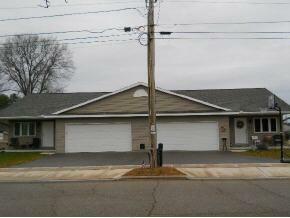 2 attached 2 car garages, central A/C, GFA heat. Fully applianced with washer and dryer hook-ups. West side has a gas fireplace, east side has all hook ups for a gas fireplace. Large open area for living room & kitchen, sliding door leading to patio. Full basement (poured concrete). Window treatments inc. Currently leased both 12 month.